Is Juice Plus Safe? | Awkward; Yet Healthy. Is Juice Plus safe? Well, that depends. Are fruits and vegetables dangerous to you? I mean that’s really what it comes down to. Juice Plus is food, not a vitamin, or an unregulated supplement. You are more than welcome to ask your doctor what they think, but unless that doctor is going to tell you NOT to eat more fruits and veggies, chances are they’ll tell you it’s perfectly fine. A lot of doctors aren’t super well versed in nutrition, so you may even teach them something. Let’s cover a few facts about Juice Plus, shall we? I think it will clear a lot of things up for you. Pardon my Trumpism, but WRONG! Juice Plus is NSF certified. Which is nothing to sneeze at. That means that everything listed on the label is what’s actually in the product. Nothing more, nothing less. The entire process has to meet rigorous standards of cleanliness and quality. Juice Plus also has a nutrition label, which means it’s been evaluated by the FDA. Say what you want about the government and 3rd party certifications, but they are NOT EASY to obtain. The company says it’s whole food nutrition and the government as well as the world’s leading 3rd party certification company agree. Ok, fine. But there’s no way I can give it to my kids. If there is anyone that needs Juice Plus in this world, it’s kids. From age 6 months and up. Kids are notoriously poor eaters, and they still fall under the rule of 7-13 recommended servings of fruits and veggies a day. That’s a MINIMUM of 7 fists per day. EVERY DAY. They’re growing, it’s important. We’re also learning that our DNA is not our destiny. So the earlier you start them on Juice Plus, the better. This is SO IMPORTANT to the Juice Plus company that they even offer it FREE to kids age 4 through college. The other thing to note here? Unlike those kid-centric multivitamins, you can’t have too much Juice Plus. Say it with me now: It. is. Food. Personally, I don’t gripe at my kids if they want MORE fruits and veggies, and Juice Plus is just that. See? Nutrition label and all. But what about pregnancy and nursing?! We’re used to stopping everything except a prenatal vitamin when we discover that we’re expecting, or trying to conceive. Do you stop eating fruits and veggies too? No? Good. Please don’t. 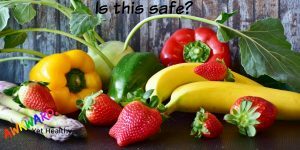 Juice Plus is perfectly safe (and encouraged!) for expectant and nursing mothers. There is no warning on the bottle to stop or consult a medical professional. Get this, you ready for it? Because it’s FOOD! If anything, during these months (or years in my case) of pregnancy and nursing you AND your baby need every little bit of clean nutrition you can get your hands on. That’s all Juice Plus is, by the way, clean nutrition. Especially with things like the MTHFR gene mutation that we’re learning about, it is becoming more and more clear that we need to get our nutrition from food and not supplements. Not convinced? Maybe this guy will have more influence than lowly little old me. What if I have a sour stomach/ I’m gluten-free/ I’m vegan. AWESOME! Me too! I have Celiac disease, Type 1 diabetes, and I’m sensitive to mushrooms and seafood. I also really like Vegan things. Guess what? Juice plus is certified gluten-free, 100% vegan, and in a capsule. Why is that (VEGAN btw) capsule important? Ever hear of those people who get those uncomfortable mouth tingles from fresh fruit? Well, the capsule allows the powder to bypass your mouth. Problem solved. And your upset stomach? It needs the probiotics and easy to absorb nutrients… ESPECIALLY if it’s sensitive and you struggle with some foods. Trust me here, once you start getting this bioavailable, easily digestible, pure gold in your system you’re going to start feeling better. That’s fine. I hope you believe science though because Juice Plus has a lot of it on their side. Juice Plus is the most researched nutritional product on the planet. I say this with love, but did you sniff out the source of the last meal you ate? Probably not. Whenever someone offers us something that sounds too good to be true, we naturally question it. Which is great! We should! But here’s the things about my beloved Juice Plus; it’s the real deal. It doesn’t replace the need to eat well and take care of ourselves, but it is a huge step in the right direction. So that’s it. Is Juice Plus safe? I’d say so. Unless you think fruits and veggies are dangerous. I mean, An eggplant with a samurai sword would sort of be my worst nightmare.